Darkwing Duck (along with Tale Spin) are the two series represented in the Disney Afternoon collection that have gone largely neglected by the house of mouse. As someone who was born after the peak of Disney’s afternoon cartoons of the 80’s and early 90’s, I still encountered the likes of Scrooge McDuck and Chip and Dale in other Disney projects. But I’ve only been exposed to Darkwing Duck through secondhand information and the NES title. It seems to have been forgotten by the likes of Disney and the broader popular culture. So I’m going into the property with an even cleaner slate than the likes of Scrooge or the pair of chipmunks. I am going in almost blind, armed only with the knowledge that this game is similar to Mega Man. Off the bat, I can see the appeal of this property by the effort put into the visuals alone. Since every level takes place within a single city, the game takes on a fun localized feeling that I appreciate. This may sound like a limitation, but it ends up being a positive due to the amount of variety that is derived from the game’s setting. Similar to Mario Sunshine, Darkwing Duck takes a thorough exploration of the environment it takes place in, offering bridges, rooftops, neighborhoods, docks, sewers, construction zones, and even a forest. This is bolstered by well executed visual design that uses distinct palettes for each level to create a sense of diversity in its locales. Darkwing Duck’s visuals are one of its best aspects and provide a much welcomed change of pace from similar titles. Darkwing Duck has developed a reputation of being a lost Mega Man title- and it’s easy to see why that claim is so commonly made. 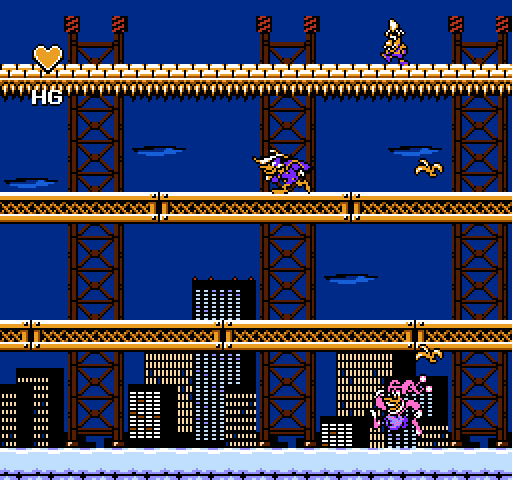 Darkwing Duck is an action platformer where the player controls a character who in many ways feels like Megaman. He moves at a similar speed to the blue bomber, and even has the familiar limit of having up to three shots on screen at a time. Levels are structured in similar ways, with the focus shifting from enemy-packed areas to instant death platforming segments, to combinations of the two. However, Darkwing differs from Capcom’s mainstay series in some key ways. The terror that flaps in the night is unable to slide- instead he has the added option of ducking and shooting. He has also gained the ability to block shots with his cape by holding up on the D-Pad. We also get a nice sense of context for each stage, with them being selected from a map of the city and being preceded by an explanation of why you need to complete that level. This small but enjoyable addition would later be adopted by the Mega Man series- and rightfully so. Those few lines of text make the following level feel more meaningful and engaging. Instead of gaining new weapons from defeated bosses, Darkwing Duck just picks them up during the course of the level. He can only hold one at a time, but thankfully, ammo is interchangeable between weapons. This weapon system is inferior to that of Mega Man, as there are less weapons, they are less versatile, and they don’t have the interesting context of being taken from a boss. I can appreciate the attempt at trying to switch up the weapon system, but it did not pay off here. The game also heavily revolves around a grappling mechanic wherein our caped hero can hang from certain platforms and pieces of the background, such as lanterns or pipes. While some sections make clever use of this, such as one which requires the player to drop from handle to handle as they scroll through a hallway full of spikes, I am not a fan of this inclusion. Darkwing Duck is too inconsistent in managing to actually grab onto narrow objects, leading to many frustrating moments and seemingly unfair deaths. In many cases, this is due to the sprite for the graspable object being larger than its hitbox. Further compounding the issue is the fact that the process of moving up or down through a platform is slow and clunky, making it unsatisfying to use in combat and causing particular frustration during the boss fights. And that issue ties into another problem. Darkwing Duck does not control gracefully at all. Bafflingly, the heroic bird can’t run and shoot at the same time. This may not sound very bad on its own, but it ends up becoming a major annoyance through the course of the game. Darkwing Duck is an action platforming game where the protagonist has been shot in the foot. I cannot understate how damaging this simple change is. It is a small, but crucial flaw. This limitation kills the all-important sense of gameplay flow and makes fighting the game’s variety of enemies an annoyance, rather than an engaging challenge. This is not at all helped by the fact that many enemies and their projectiles move unreasonably quickly. They would give Mega Man a run for his money, but they are simply too much for the less agile Darkwing Duck to handle. A large number of enemies simply feel like they were not designed with Darkwing’s more limited movement in mind. And when combined with the unreliable ledge grabbing ability, these problems make Darking Duck a frustrating game to play. Oftentimes, deaths feel cheap because it feels like I’m trying to play a tougher Mega Man game with a hamstrung character. Bosses (while looking interesting and fun to challenge on paper) are particularly frustrating because they are the place where the game’s issues coalesce into a frustrating, clunky bullet sponge. With all of these issues in mind, would I claim that Darkwing Duck a bad game? Despite the list of problems, I cannot say that Darkwing Duck is wholly bad. It is deeply flawed, but there are a lot elements that I like. The visuals and use of setting are excellent. The attempts at changing the weapon system can be improved if elaborated on. And the bosses are interestingly designed and would make better use of Darkwing Duck’s mechanics if controlling him was a smoother experience. Ultimately, Darkwing Duck is a whole that ends up being less than the sum of its parts. It is a collection of good ideas that are eclipsed by poor controls that do not complement the rest of the game’s design. It’s a shame this game didn’t get a sequel, as it wouldn’t take much to iron out the kinks in its controls and enemy design. As it is, Darkwing Duck is a good game obscured by a series of debilitating control flaws. Wha... but I loved this game! Mostly I just loved Darkwing Duck the TV show. Hmm. I wonder how I would feel if I put some real time into it now? I actually played the game a bit recently at a party at yeah the no shooting while running is a bizarre choice that hampers it. Never played it, but the graphics are pretty hype. I don't mind clunky old-school games on occasion (StarTropics), but not if they control badly. I like to think I'm pretty adaptable to different controls, but even if you get used to how Darkeing Duck plays, the controls still hamper the game feel. That's why I think this isn't just a "me" issue. I'll write a proper reply later, but: I don't think the controls are truly bad. I do however agree with the gripes Hero_Of_Hyrule brings up; the ledge grabbing and certain enemies. I don't think their designs are bad, but their placements can be. The stage design in general could do with some tweaking in my opinion. Even the visual designs, which -- while really pretty -- rely a bit much on greys and blues, IMO. But anyway, the controls are essentially Mega Man controls (I think it's essentially a reskinned Mega Man V at its core, but I might be remembering that wrong) with Duck Tales 2 stuff tacked on, and they don't mesh very well. I look forward to your larger reply. I'm ok with the frequency of blues and greys because they help establish a consistent atmosphere without becoming tiresome for me. There's enough variety in the settings that I didn't even notice how frequently they were used. Oops, I totally forgot about that. I blame E3.